Environmental Working Group (EWG) just released their updated 2012 safe sunscreen guide – good news if you’re overwhelmed by all those sunscreen choices out there. As usual, most of their safest sunscreen winners include sunscreens made with zinc oxide or titanim dioxide, both of which are preferable and safer than chemical ingredients such as oxybenzone. This year EWG notes that an ideal sunscreen choice should block both UVA and UVB rays, contain active ingredients that do not break down in the sun and of course, be free from an insane amount of toxic chemicals. If you’re interested in how EWG conducted their analysis and ranked products this year, check out their sunscreen FAQ. Before we take a look at this year’s sunscreen winners and losers, remember that sunscreen is only one way to help protect your skin from sun damage. Limiting sun exposure during peek sunny hours and wearing protective clothing are also important actions. Also, don’t forget, sunscreen is only effective if you actually apply it correctly. This means you should apply sunscreen generously 30 minutes before going outside and reapply it every two hours. Keep reading to see which sunscreens earned top spots on the EWG list this year. Many great sunscreens made the EWG list this year. You can see the full safe sunscreen list at EWG, but here are 10 top choices to get you going. Synthetic chemical sunscreens: Sunscreens like Banana Boat Kids Quik Blok Sunblock Spray Lotion and SPF 35 and Coppertone Water Babies Sunscreen Lotion, SPF 70+ are dvertised for babies and kids but contains oxybenzone, a synthetic chemical that can disrupt hormones and cause allergic reactions. Sunscreens with vitamin A: EWG notes that vitamin A, also known as “retinyl palmitate” or “retinol palmitate” on ingredient lists, shouldn’t be in sunscreen due to vitamin A’s link to skin tumors and lesions in some studies. There’s debate about this issue, as some people think vitamin A is not a huge danger, but sunscreens with this ingrediant did make the EWG hall of shame list this year. 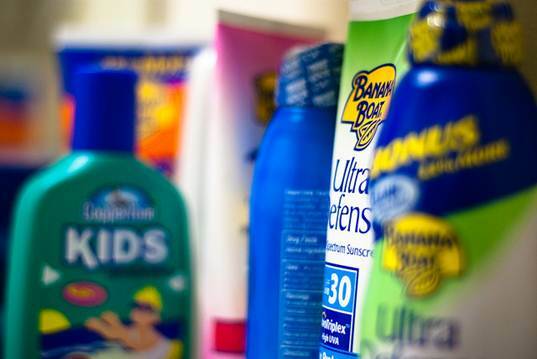 Typical offenders include sunscreens like Banana Boat Baby Tear Free Sunblock Lotion, SPF 50+, Arbonne Baby Care Sunscreen Lotion, SPF 30 and Australian Gold Baby Formula Lotion Sunscreen, SPF 50+. Sunscreens labeled higher than SPF 50: EWG points out that, “Sky-high SPF products may protect from sunburn, caused primarily by UVB rays, but they leave children vulnerable to skin-damaging UVA rays.” Higher SPFs may also lull parents into a false sense of security, letting them think they don’t need to apply more sunscreen. With this in mind, EWG says to cut back on high SPF sunscreen like Neutrogena Wet Skin Kids Beach & Pool Sunblock Stick, SPF 70. 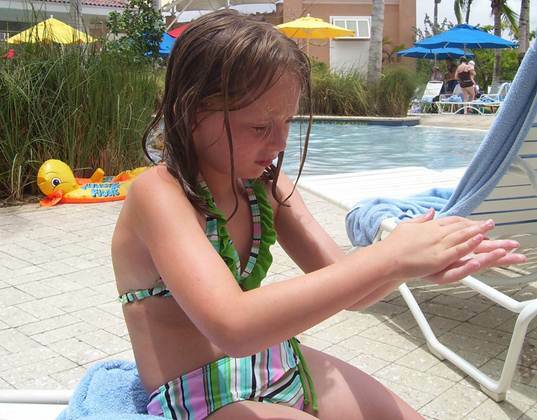 Sprays and powders: Aerosol spray sunscreen is often marketed to kids, yet sprays pose serious inhalation risks and make it easy to miss spots of skin, leaving your child exposed to harmful rays. Two hall of shame sprays this year include CVS Kids Fast Cover Continuous Clear Spray, SPF 50 and Rite Aid Baby Continuous Spray Sunscreen Lotion, SPF 50. Another problem are loose powder sunscreens which emit a plume of airborne particles. If inhaled, these powders may damage lungs. EWG notes that, “Powdered sunscreens may also contain nanoscale and micronized zinc oxide, which can cause lung inflammation and worse.” GO!screen Natural Mineral PowderBlock Brush-On Sunscreen, SPF 30 is one such powder. This year EWG also recommends avoiding sunscreen towelettes because no one is sure if they work plus super overpriced sunscreens because there are less expensive sunscreens available. They also remind consumers that just because a product is marketed to kids or babies, doesn’t mean it’s safe. Always read your labels. If you want a sunscreen guide to carry with you this year, be sure to get the new Guide to Safer Sunscreens. This guide is available for the price of a small EWG donation (just $5) and is nicely wallet-sized so you can carry it in your bag and make smarter choices when shopping for sunscreen. Environmental Working Group (EWG) just released their updated 2012 safe sunscreen guide - good news if you're overwhelmed by all those sunscreen choices out there. As usual, most of their safest sunscreen winners�include sunscreens made with zinc oxide or titanim dioxide, both of which are preferable and safer than chemical ingredients such as oxybenzone. This year EWG notes that an ideal sunscreen choice should block both UVA and UVB rays, contain active ingredients that do not break down in the sun and of course, be free from an insane amount of toxic chemicals. If you're interested in how EWG conducted their analysis and ranked products this year, check out their sunscreen FAQ. Before we take a look at this year's sunscreen winners and losers, remember that sunscreen is only one way to help protect your skin from sun damage. Limiting sun exposure during peek sunny hours and wearing protective clothing are also important actions. Also, don't forget, sunscreen is only effective if you actually apply it correctly. This means you should apply sunscreen generously 30 minutes before going outside and reapply it every two hours. Keep reading to see which sunscreens earned top spots on the EWG list this year.